My musical life since moving to CA has been a little "all over the place." So far I've taken this year to sample different orchestras and different instruments. Do I want to play violin, viola, or both? Which orchestra has the best fit for me with respect to rehearsal venue, concert venue, conductor, repertoire, and community? One great thing about the SF Bay Area is that there are so many groups to choose from. The local public radio station, KQED, just did a story about it: Silicon Valley Really is Having More Fun Playing in Community Orchestras. They interviewed several people I know from having played in the Nova Vista Symphony last fall. But I didn't actually play Tchaik 5 in the concert they're writing about there. 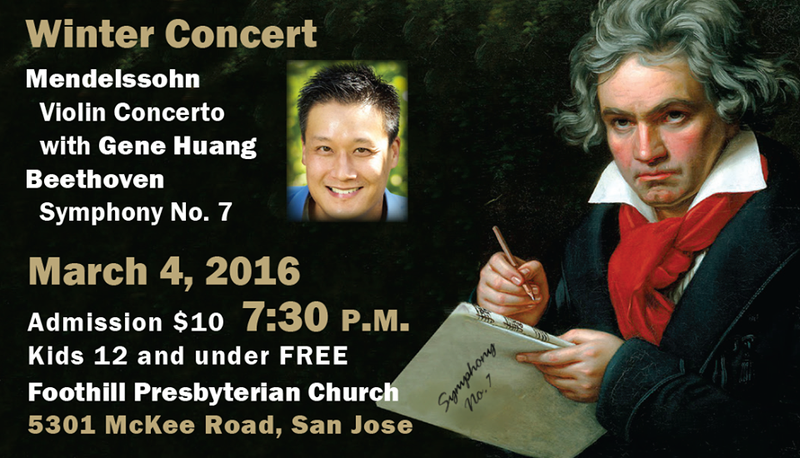 Instead, this concert cycle, I am playing Beethoven's 7th with the South Bay Philharmonic, which was also given a brief mention in the article. The South Bay Philharmonic is more informal than Nova Vista, with a number of adult starters and re-starters in its ranks. It evolved from the former Hewlett-Packard orchestra. I first found out about the group from its concertmaster, fellow violinist.commer Gene Huang, whom I knew from participating in the Rockin' Fiddle Challenge a few years ago. He's performing a movement of the Mendelssohn Violin Concerto on this concert. This made a good story for when I had to stand up and introduce myself at the first rehearsal. (No, violinist.com is not a dating site . . . ) And anyway, I'm playing viola for this concert. For the first couple of rehearsals, I fell victim to "violin moments," an annoying phenomenon in which you forget which instrument you're playing and which clef you're reading. Usually, for me, that means I play whatever is written a third too high because I've forgotten what note it is and have fallen back on playing fingerings rather than notes. I've managed to get through that now and am at the stage where I can keep up and get through the music from beginning to end with few-to-no obvious mistakes, wrong notes, missed dynamics, flying page turns, or flubbed entrances. There are always things to work on with respect to tone, musicality, and ensemble, though. When I was making the initial decision of what concert to play, I made it largely based on repertoire. I wanted to hear Gene play the Mendelssohn. And something about coming out here and starting over, and hitting a milestone birthday in December, made me realize again that life is not infinitely long. I've played most, but not all of the Beethoven symphonies. I have read through but not performed 1, 2 and 9. I have performed 3 three times, 5 once, 6 once, and now 7. Will I get a chance to do 4 and 8? I knew this piece to listen to, of course, before this concert. Everybody does. But there is something different about knowing it well enough to perform it in concert. For some pieces, this getting-to-know-you process can start out as a bit of a chore. You sit down with the score in hand, earbuds in ears, press the virtual play button and the music starts. Maybe you get lost. Maybe your mind wanders and you have to bring it back to the score in front of you. This piece, for whatever reason, is different. I get to skip the awkward introductory period and get right to the good part. I listen to it in the car, and while I'm making dinner. Before long I know where the horn part comes in, and can sing it. It becomes my "get psyched" music to listen to before I teach class, as I drive 45 minutes north on Highway 280, watching the sun rise.I feel this way about all the Beethoven symphonies. And the Emperor piano concerto. I don't play the piano, but when I was 17 I set up my alarm clock to play the fanfare section from that concerto to get myself out of bed in the morning. (This was actually complicated with a cassette player, well before iPhones/Pods/Pads existed). "All tumult, all yearning and storming of the heart, become here the blissful insolence of joy, which carries us away with bacchanalian power through the roomy space of nature, through all the streams and seas of life, shouting in glad self-consciousness as we sound throughout the universe the daring strains of this human sphere-dance. The Symphony is the Apotheosis of the Dance itself: it is Dance in its highest aspect, the loftiest deed of bodily motion, incorporated into an ideal mold of tone." March 6, 2016 at 10:17 PM · Karen - thanks so much for updating us on your adventures out there on the Left Coast. I am not surprised that you have been spending time trying out different possibilities both in terms of instruments and groups. Indeed, it is perhaps one of the blessings of being in a situation where your life has been totally changed. You suddenly get the chance to try out a whole bunch of new opportunities. It sounds as if you have gone for the one that suit you best for the moment. Enjoy! March 7, 2016 at 06:08 PM · My "clef failures" are "bass moments" rather than "violin moments" because I taught myself alto clef relative to bass clef rather than treble clef. Somehow I thought it would be better. Recently in orchestra we got a viola part that has a couple of pages of treble clef. It's not super high (4th position only) but it did seem weird. Recently I saw The Knights, a Brooklyn-based chamber orchestra. Going clockwise from the conductor's left, it went 1st violins, violas, cellos, and finally second violins. I'd like to see Gene Huang play the Mendelssohn too. He plays very well. After years of being on the fence about it, I've decided that I do not like the practice of seating the second violins in an orchestra opposite the first violins, rather than next to them. I know some pro orchestras do it nowadays but I just disagree, at least for community orchestras. I think it benefits both violin parts to be able to hear and support each other due to being in close proximity (And I'm sure lots of people care about my opinion--LOL). 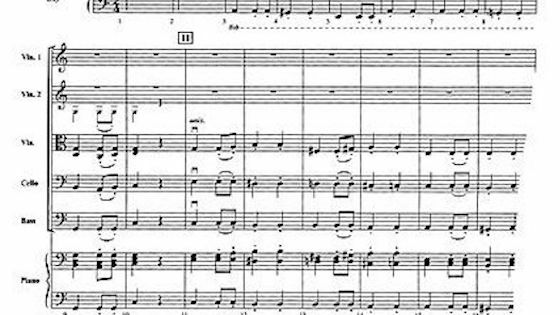 March 9, 2016 at 06:08 AM · I'm glad to see you found an orchestral home, Karen, and that George Yefchak conducting his own orchestra now. I remember him from my days with Redwood Symphony back when I lived i the Bay Area. March 9, 2016 at 06:30 AM · Lydia did you know Tanya Wu Gross or Romain Kang? They both play or used to play with the Redwood Symphony and recommended it to me as an orchestra to try out (Tanya is a cellist and Romain is a violinist who also studies with my teacher in Palo Alto). I saw one of Redwood's concerts in the fall and enjoyed it. It seemed like a great group, but It also seemed like it was kind of far to drive (especially relative to the SBP, for which I could walk to rehearsal if I planned ahead a little better). Plus I think you have to audition for Redwood, and I'm not up for auditions at the moment.